24 year career soldier, trade disciplined in Electronic Engineering. 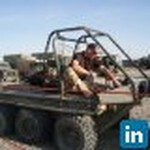 Having worked my way up to the level of a Senior Resource Manager, capable of operating in a multi-skilled/multi discipline environment, ensuring the most efficient use of materiel and manpower to consistently achieve specified customer results often managing to return results in excess of thier expectations. Senior Facilities Manager for a Workshop of 180 personnel within a larger corporate structure, ensuring the completion of a change management project and relocation of all materiel and equipment in line with a corporate restructuring, whilst maintaining the productive capabilty to the customer with minimal disruption through process prioritisation. Join Today to follow and contact Simon Allen.